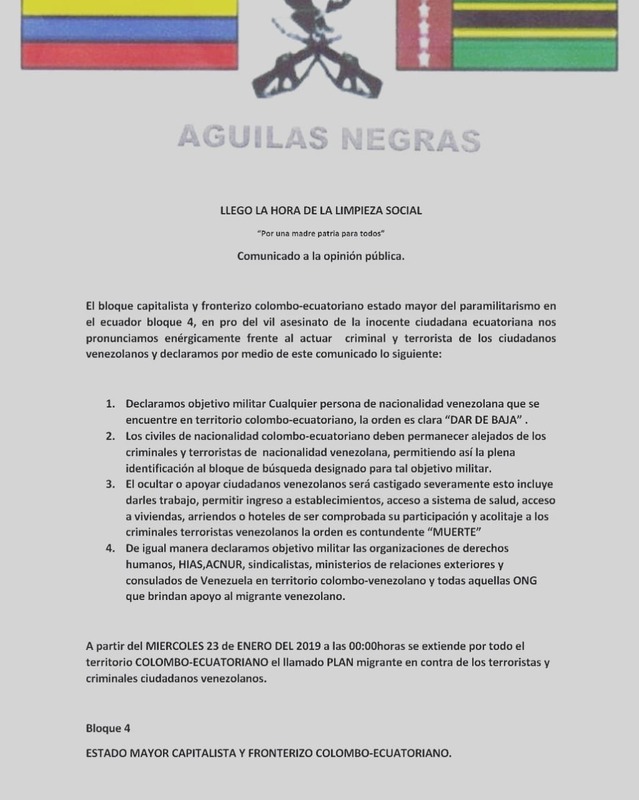 A far-right group in southwest Colombia, saying they are The Aguilas Negras, on Tuesday threatened to kill all Venezuelan citizens, and officials who help them in the border region. The hiding or helping of Venezuelans citizens will be punished severely. This includes giving them work, allow them access to establishments, access to health care, access to housing, rentals or hotel rooms. If your participation and assistance to terrorist Venezuelan criminals is proven, the order is a certain death. The far-right movement also declared war on national and international humanitarian and rights organization including the United Nations’ refugee agency and labor unions. The embassies and consulates of the Venezuelan government was also declared a military objective, the group said. Leftist lawmakers and indigenous leaders have claims that the group works together with the country’s military intelligence. Particularly in the Nariño and Cauca provinces in southwest Colombia, pamphlets signed by the Aguilas Negras have threatened ethnic minority leaders almost constantly. Armed men assassinated at least 92 indigenous last year, according to Senator Feliciano Valencia, an indigenous leader from Cauca. At least 42 of the assassinations took place after President Ivan Duque took office in August, the lawmaker said in Mid December. Valencia’s brother was seriously injured in an attack last year, one day after the senator from Cauca received a threat from the Aguilas Negras. The events began to occur on December 3 when they murdered an Afro colleague from the municipality of Caloto. Afterwards, two murders were committed against indigenous authorities of the Awa people of Nariño, followed by the murder of Edwin Dagua in the north of Cauca. That same day they murdered another colleague in the village of El Palo de Caloto. Then they murdered a member of a peasant organization in Corinto, followed by the kidnapping of two indigenous community members, who were approached by armed men while carrying out agrarian work in the municipality of Suarez, in the west of the department. To date we do not know what happened to them. And today another comrade was murdered in the municipality of Buenos Aires… This is the wave of violence that is currently affecting the north of Cauca and Nariño, and extends to Caldas, Antioquia and Choco. Whoever is behind the Aguilas Negras is uncertain. Unlike paramilitary groups like the AGC that have a leader, a hierarchical military structure and armed combatants, the far-right group seems to have none of these. 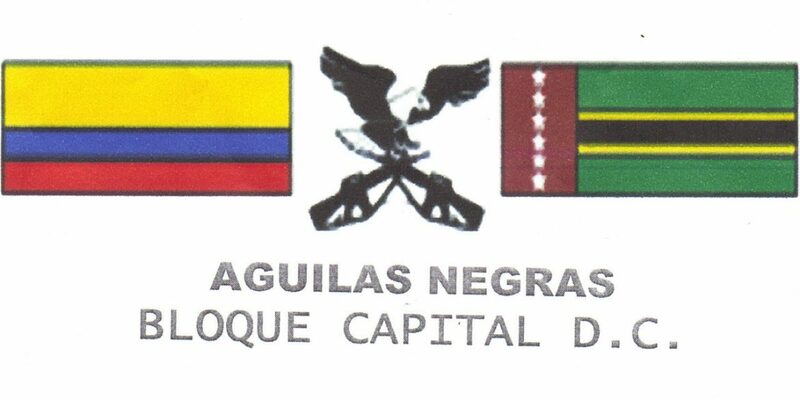 But the terror they impose is very real, and many killings of social leaders follow the Aguilas Negras’ death threats. Until earlier this week, the victims of this terror were mainly ethnic minorities, now they include Venezuelans.